Following the success of their incredible Millennium Falcon, Han Solo, Luke Skywalker, Kylo Ren, R2-D2 and Rebellion sneakers, the incredible team at Po-Zu have set their sights on Resistance. Their amazing ethical range of vegan-friendly sneakers have taken the world by storm in recent years and are flying across the world to take pride of place in Star Wars fans’ collections everywhere. The greatest characters of the saga have been well represented amongst their exceptional range but now, CEO Sven Seagal and his devoted team are about to choose a side in the struggle against the First Order. 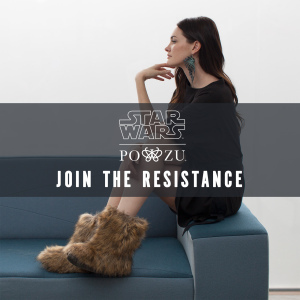 Ahead of next year’s highly-anticipated finale of the Star Wars sequel trilogy, Po-Zu, the brand behind Rey’s boots (portrayed in the films by actress Daisy Ridley), have released their latest design for fans around the world. The new Luxury chrome-free leather RESISTANCE sneakers in Black and White have the Star Wars Rebellion logo embossed on the side of the shoe and the organic cotton Star Wars label on the tongue. Since the co-branded footwear range began, the Star Wars | Po-Zu collaboration has been worn by Star Wars fans and celebrities alike, including Mark Hamill (Luke Skywalker), Daisy Ridley (Rey), John Boyega (Finn), Kelly Marie Tran (Rose) Anthony Daniels (C-3P0), Billy Dee Williams (Lando Calrissian), Warwick Davis, Kevin Smith and Youtuber Casey Neistat. Similar to all Po-Zu shoes, these sneakers are perfect to wear at Comic Cons, around town or in the office thanks to the comfort of the unique Foot Mattress. The sneakers some in sizes 36-43 EU (3-12 UK) and (5-13 USA) and will retail for £145. “From catwalk to street, the Star Wars | Po-Zu footwear line is coveted throughout the world for its style and comfort, with no need to compromise on ethics or aesthetics.” Sven Segal Founder and CEO. The shoe has been designed for the Star Wars community, a classic design with a nod to the films. It joins the full RESISTANCE range, all handcrafted in Portugal, for women and men. Sven and the great team at Po-Zu have excelled with their incredible Star Wars range and have consistently defied our expectations to produce some of the finest footwear in fandom, and the Resistance sneakers, priced at just £145.00 are no exception. So, which side are you on? Whether you choose the white or the black you can explore your rebellious side and take your first steps into a larger world. The Resistance needs you in their struggle against the First Order…so what are you waiting for? Check out the full Po-Zu/StarWars Star Wars range and feel the Force on your feet this summer! Reblogged this on Luminous Beings NYC.